The average stock in the large-cap Russell 1,000 index fell 9.18% in 2018. Nine percent of stocks in the index gained more than 20% in 2018, while 35% of stocks fell 20% or more. 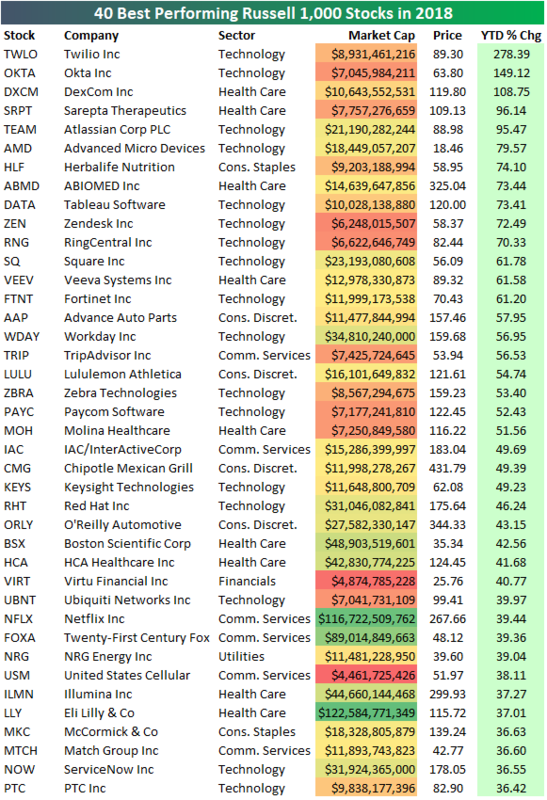 Below is a list of the 40 best-performing stocks in the index in 2018. Twilio (TWLO) took the top spot with a gain of 278.39%, followed by Okta (OKTA) in second with a gain of 149.12%.T he only other Russell 1,000 stock that posted triple-digit percentage gains in 2018 was DexCom (DXCM) at +108.75%. Note that 13 of the 14 best performers came from either the Health Care or Technology sectors. Herbalife (HLF) is the only non-Health Care or Technology stock that cracked the top 14 with a gain of 74.1%. Netflix (NFLX) and Eli Lilly (LLY) are the only two stocks with market caps greater than $100 billion that made the list. NFLX posted a 2018 gain of 39.44%, while LLY gained 37.01%. These performance numbers ended up being a far cry from the huge gains that dozens and dozens of stocks were sitting on back in September.